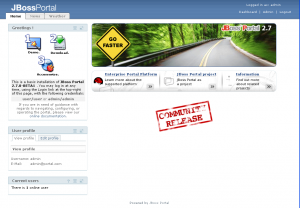 Liferay…I need a Life Jacket; Giving JBoss Portal a Try. After completing my previous post on Liferay I began to see that things were really not deploying properly from the EXT environment. I went back and tried the simpler plugins SDK and continued to experience more trouble getting just the basic portlets to build and deploy properly. Thus a series of forums posts (which were always answered quickly and in a friendly helpful nature) I have determined that 5.1 is just not ready for use unless you are an experienced LRP developer. So I had a choice to either drop back and use 4.3 or try a different platform. 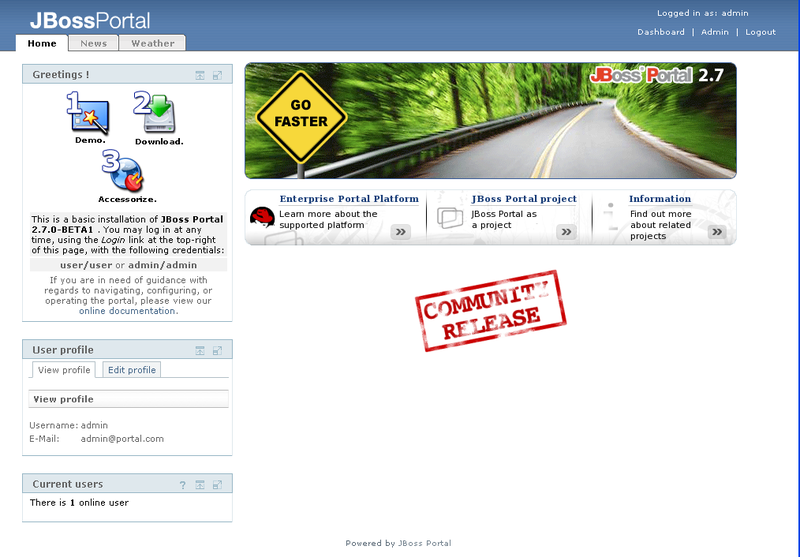 Because I want to use the latest frameworks like Seam with my portal, I decided to give JBoss Portal (JBP) 2.7 a try. There’s a decent set of documentation in HTML and PDF format to show you around. JBP and LRP are roughly equivalent, although they tend to leapfrog eachother and JBP tends to integrate heavily with other JBoss middleware products. Pom.xml is the configuration file maven2 will look at to find things for aq project/build. It is located in the project directory. Just stick this “repositories” block at the end of the file before the end </project> tag. Once the .war build correctly, dropping it into the deploy directory of your jboss server deploys the module as expected. My next task was making mods and deploying them. I used Eclipse 3.3.2 with the JBoss Tools. That’s an easy install, just grab them, extract them, and place them into the plugins and features folders. Then start up Eclipse with the -clean option (I have this set permanently). Once I did that I could import that existing project into my workspace and screw around. First I had to fix the fact that Elcipse could not find the portal api 2.0 jar – no problem at all, just point it to the repo url for your maven config. After you do a build it will put jars and unresolved things from your project there. My changes are there. Not bad – and something that I could not get working with Liferay. That’s not a condemnation of LRP, just a simple fact. I have no experience with either tool and yet I could sit down in less that one day and do something I tried for several weeks to do with Liferay. So JBoss is what I’ll be using right now. I’m going to get working on some portlets and post a follow-up on this for how I do. I’m going to work on a few DB things, MVC stuff, and see if I can get some Seam portlets working. Update: I’ve posted part 2 here. Perhaps LRP is very powerful and has a lot more stuff than JBPM but it is really hard to get sarted with it. Real Hard!! JBP has everything you need and its much simpler to work with. So, the same as you, my decision was to use JBP enforced by the fact I’m already using seam and richfaces. Thanks for your interests and your posts about Liferay Portal. I’m one of its developers and would like to know a little bit more about the specific problems you found out to try improve that area for the next releases. Could you post here the links to the forum entries you posted? Antonio, Berener, please feel free to let me know the problems or difficulties you encountered. Were they caused by lack of documentation, lack of tools, errors, anything else? My forum posts are all under “Beren Erchamion”. I’ll try to find the links…but they should come up under my name. I’ve answered in the forums.